If there was ever an invention that needs to be improved, it’s the skateboard. Those four wheels are totally superfluous. Improvements have been made, sometimes to interesting results. 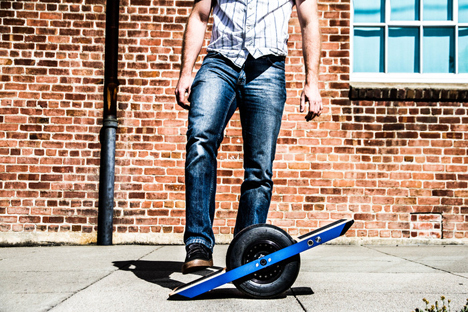 The Onewheel is the latest in foot-based transportation. The Onewheel is an electrically-powered personal transportation device created by California-based company Future Motion. It features (you guessed it) a single wheel set inside a plank. The company’s Kickstarter page calls it “the self-balancing electric skateboard that gives you the feeling of flying.” While that statement may be a bit grandiose, this simple machine has some complex innards. It’s 48V lithium nano-phosphate (LiFe PO4) battery gives it enough power for about a 20-minute quick ride, or up to two hours if charged longer. 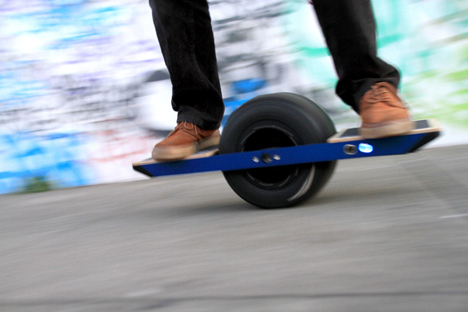 The custom self-balancing controller drives the 12″ wheel, along with a 500W direct drive motor. All of this allows the user to glide over the pavement at up to 12 MPH. Future Motion plans on improving the battery life, and you can slide in on a first-run Onewheel for about $1,400.